A modern drilled well is more than just a hole in the ground. It must be properly lined and sealed to prevent contaminated surface water from entering, and must have special screens at the end in loose soils to maintain a good flow and filter out silt that could clog the well. Finally, a pump must be installed along with underground plumbing to a pressurized storage tank in the house. If you buy a piece of land with a “well installed,” you will still need to pay for the pump, trenching, plumbing lines, and pressure tank – which may cost as much as the drilling itself. 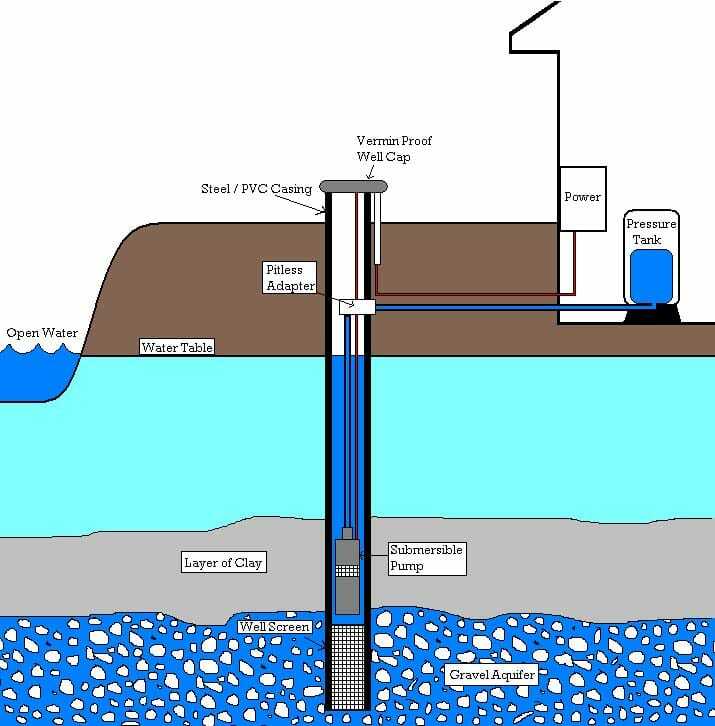 CLICK TO ENLARGE A modern drilled well is properly lined and sealed to keep out contaminated surface water, and may include a special screen at the bottom to filter out silt in loose soils. The casing is a steel or PVC pipe, typically 6 inches in diameter, that extends from about a foot above grade to the bottom of the well or to the point where it hits solid rock. PVC is now commonly used for the casing as it is inexpensive and highly resistant to corrosion. However, steel is still common in some regions. The casing keeps soil and rock fragments from collapsing into the well shaft, and provides protection for the wiring and water piping connected to the submersible pump near the bottom of the well. State codes often require a minimum of 18 feet of casing in unconsolidated soil (i.e., not solid rock). At the point where the casing meets bedrock, it is sealed or “seated” into the rock using either cement, bentonite clay, or other techniques. A modern well head rises about a foot above grade and is tightly capped to keep out contaminants. The smaller PVC pipe protects the wiring for the submersible pump. At the top of the casing is the visible well head, which is tightly capped to prevent contaminants from entering the well casing. The wiring for the submersible pump is protected at the well head by PVC piping. The well head should be inspected periodically for damage. If the bottom of the well is in solid bedrock, pure water reaches it though narrow cracks and fissures in the rock. However, if the bottom of the well is in sand and gravel, it needs special filters to prevent sediment from entering the well, degrading water quality, and harming the pump. Wells that terminate in loose material use a filtering device called a well screen, installed at the bottom of the well casing, to keep soil particles from entering the well. There are many types of screens available and designed with openings sized and shaped for the specific type of soil. Given the cost and difficultly of replacing the screen, it’s worth spending a little more for a high-quality screen that will resist damage during installation and corrosion during service. In addition, a gravel pack several inches thick is usually placed around and above the well screen, unless the soil is already coarse sand and gravel. The gravel pack provides a prefilter to keep fine sand and sediment from reaching the screen and well. This allows the use of a screen with larger openings, improving the flow rate. The packing gravel must be carefully sized or it can get clogged with sediment and block the water flow. Before the well is fully functional, it must first be “developed.” Web development removes the fine particles of clay, silt, and sand leftover from the drilling process, especially around the area of the well screen. This improves the quality and flow of water from the aquifer into the well, and helps protect the pump from being damaged by sand and silt intrusion. A number of different methods are used, all involving forcing water or compressed air into the well at high speed, often with reversal of the flow, to effectively flush out the fine particles. Common techniques include overpumping, backwashing, and surging (with compressed air, bailer, or surge block). Depending on the well characteristics this can take from one to several hours. If all is working properly and the well yield is acceptable, the “annular” space between the casing and borehole is “grouted” with cement to or bentonite clay to prevents contaminated surface water from draining into the aquifer. The well is then disinfected and capped at the top to provide sanitary conditions until the well is put into use. Once the well is completed it a yield test is done to determine the how much water it can deliver over an extended period of time. How much water is needed depends on the size of the household and any special equipment or activities that use a lot of water. For an average household, a figure of 110 gallons per bedroom per day is often used. In addition to the total daily load, there is also the issue of peak load: can the supply meet the simultaneous demands of, say, the dishwasher running while someone is showering. The minimum acceptable level for most single-family homes is 5 gallons per minute, the rate required by many mortgage companies. With some storage, this allows occupants to run two average fixtures or appliances at the same time, meeting typical peak demand. Rates above 10 gallons per minute will meet most household demands with no storage. However, wells with rates as low as 2 to 3 gallons per minute can provide adequate pressure and flow by adding a larger than normal pressure tank, a storage tank that used in most modern well systems. For wells drilled into bedrock, hydrofracking is a process that may increase the yield significantly. The technique, originally developed for oil and gas wells, injects water into the well under high pressure in order to enlarge or create new water-bearing fractures and fissures in the bedrock surrounding the well. Hydrofracking equipment is now pretty common in areas with a lot of bedrock wells. The process is expensive, but usually less than drilling deeper or drilling a new well. If it works, the benefits of hydrofracking should be permanent. However, as with all well drilling, there is no guarantee that hydrofracking will work. Still, some well drillers now offer a written guarantee that hydrofracking will increase your well’s yield, subject to the small print of course, but certainly better than no guarantee at all. If you buy a site with a well already drilled, it’s just a hole in the ground with a casing and cap. To complete the well, you will need a submersible pump, a pipe run from the well to the house, and a pressure tank installed in the home. Don’t skim on the well pump as it is an expensive item to replace and a top quality pump does not cost much more than a mediocre pump. The size of the pump is determined by the yield of the well, the daily use of water, and the amount of storage. One of the leading causes of pump failure is lighting strikes as a well provides a good grounding source for lightning. Since replacing a pump can cost $1,500 or more, it may be worth considering a lightning protection system for the pump. This usually involves installing a grounding rod close to the well and other measures. Make sure the work is done by a professional electrician with experience in lightning protection. Typical storage or “pressure” tanks for private residences range from 20 to 40 gallons, but may need to be larger for low-yield wells. The pressure tank provides pressurized water to the household between pump cycles, helps meet the household demand beyond the pump capacity, and also above helps prolong the life of the pump (by preventing rapid cycling). 3-5 gpm 100 gal. 150 gal. 200 gal. 250 gal. 1-3 gpm 150 gal. 200 gal. 250 gal. 300 gal. Hello. We live in Rochester MN. We have a shared well amongst 5 homes. We had pressure problems for years. In July 2014 a local well company in business for over 60 years with good references converted our well to a constant pressure system. Work involved digging out old large stainless steel tank replacing with new I think fiberglass tank, new pump, controls, etc. Water pressure problems were solved and all families pleased. Well driller suggested leaving land around well undisturbed for 1 year to let ground settle. He also advised us that well head needed to be in a mound 12 inches above top of mound to prevent standing water. Well driller also recommended simple/minimal landscaping around well to make future well access practical. What’s our problem? Neighbor whose land the shared well sits on thought wellhead was unsightly (Note: wellhead is in exact position it always was, it never moved from old location. All well power and controls were moved next to the adjacent woods and in fact now more hidden than previously). Neighbor proceeded to put in a rather elaborate landscaping planting around the wellhead. Work was done 11 months after conversion to constant pressure system. This included elevated planting bed, plants and a tree. Also a number of large real boulders were placed as part of the design. The wellhead ended up less than 12 inches from the ground and the neighbors had to fix that. We had no problems until 3 weeks ago when we suddenly developed a massive leak around the well. Water coming up through ground around the well, a huge leak. The driller dug all of this out and found that fitting for pressure tank had sheared itself off. The threads were sheared which to him meant some excessive force pulled this free. The tank too had shifted positions. This well company has been in business for years and never seen this before. While not sure of cause they think the problem was excessive ground shifting that occurred around our wellhead. A concern they raised was the extensive landscaping (done 11 months after our well upgrade) which most likely required bobcats to move all of the dirt for the bed creation and the large boulders used in the landscape design. The driller during their recent work had to use their backhoe to move these boulders out of the way due to their large size and weight (estimated to be over 1000lbs). The driller isn’t sure of cause but does worry the excessive weight of the bobcats and boulders in this case lead to the excessive ground shifting. They have put in several other well systems in our area with the assumption that the soil conditions are similar and haven’t had this problem. None of the other wells we’ve seen have extensive landscaping with heavy boulders. Our well is now fixed. We don’t want a repeat event and are looking for suggestions on how to best treat the land around the wellhead. Thank you. Sorry to hear about your situation – sounds like a lot of extra cost and hassle. From a distance I cannot possibly say anything definitive about what caused your problems. There are too many variables and unknowns. It certainly sounds like excessive settlement caused the tank to shift and possibly caused the fitting to shear. In general, excessive settlement is caused by placing a load on uncompacted fill. Perhaps the well contractors over-excavated and refilled the hole with excavated dirt before placing the new tank. Ideally the tank, or any type of construction, is place over undisturbed native soil or properly compacted fill. Granular materials such as sand and coarse gravel are best. Some type of gravel are considered self-compacting. Uncompacted fill will settle under a load or under its own weight from wetting and drying cycles. What role the boulders and heavy equipment played is also hard to say. My guess is that the equipment played a larger role than the boulders. A Bobcat weighs a few thousand pounds, while many backhoes weigh over 10,000 pounds. Heavy equipment certainly compacts the soil underneath, which can kill nearby trees by compacting soil around the roots. Backhoes can also damage foundation walls by getting too close to the building before the floor framing is in place to hold the walls vertical. The downward force resolves into lateral loads on the wall causing it to tip (or crack if the concrete or mortar is still green). Regarding landscaping, I would certainly be careful not to risk damaging the new equipment. Common sense would argue to not place 1,000-pound boulders over the tank and to keep heavy equipment a safe distance away. I would follow whatever recommendations are made by the well company. It sounds like they have a lot of experience in this area. Also, whatever warranty they provide might be voided if you do not follow their recommendations. Best of luck with your new system and hope it remains free of problems! You can read several Q&As about Building on Fill here. While these questions focus on the much greater loads of a building foundation, the issues are the same. Anything placed on uncompacted fill will settle and shift over time.